The Mohican 100 is the third NUE (National Ultra Endurance) race in the series. Driving 22 hours from Breckenridge, I was excited when we finally arrived in the rural town of Loudonville, Ohio, for the race. It’s a beautiful little town full of rolling green fields, farms, and a small friendly town center. The race venue is a large campground filled with campsites, cabins, a pond and lake, a swimming pool and everything that would remind you of being at summer camp. We arrived Thursday evening to a quiet campground filled with humid air, hazy green rolling hills and abundant green vegetation. The quietness was short-lived and by the next day the campground had filled with some of the 700+ racers making it feel like summer camp for bike racers. The Mohican 100 starts at 7:00am from downtown Loudonville. The course consists of over 60% singletrack and less than 40% road/double track. At the start, all 700+ racers in the 100-mile race and 100K race start together. It’s an immediate hill climb out of town that helps to spread out the racers then a few miles of road before the singletrack starts. The first 20 miles or so are mostly all one track up and down through large forests. It’s fun, gorgeous riding unlike any riding I’ve done in the West; pedaling through spacious old forests with tall trees, ferns, and so much moisture in the air. The singletrack ascends and descends quickly with very few flat areas, crossing roads briefly only to connect with more singletrack. After aid station 1, there are some short road sections, up and down hills, past old white farms with bright green pastures. The course continues through private property single and double track, on to rolling back-roads until about mile 55 when you reach the 10-12 mile railroad-grade road. Then it’s back on a mixture of singletrack, roads and dirt double track. For the men’s Open field 153 men lined up for the 100-mile event. The winner, Christian Tanguy (Rare Disease Cycling), said it was a larger pack of men out in the front throughout the race. By about mile 76, humidity/heat and other factors had left the front pack down to around five men. Not long after Tanguy made a push to break away up a steep climb, saw no one was with him and went for it. At one point he looked back and saw someone was fast approaching him from behind. It was Keck Baker (ChampsSys/Cannondale). 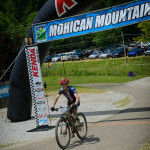 Keck caught him but Tanguy was able to gain the lead again on one of the final singletrack ascents and claim his second win in a row at the Mohican 100. 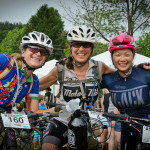 For the women’s 100-mile race there were 20 women at the start. I had the lead from the start and remained in the lead until aid station 4 at mile 76 where I saw Brenda Simril (Motormile Racing) come in right behind me. I tried to push it to keep my lead but I had been struggling for a while at that point. Around mile 80, Linda Shin (Blacksmith Cycles) caught up to me and from there we rode together for a few miles. I was able to keep up with Linda, who was riding strong at that point, but I took a bad crash while trying to gain time on a loose descent and Linda pulled ahead. At that point I felt like I was in complete survival mode, knowing that Brenda was close behind. Less than a mile out of the finish, I had another bad crash, tearing up my shorts and getting a hematoma on my thigh, at which point, Brenda passed me. At this stage in the race, I was just so incredibly relieved to be finished. 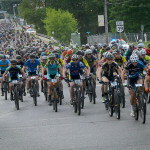 The Mohican 100 is a hard race full of short ascents and descents, some technical singletrack, steep climbs, and over 10,000 feet of climbing. But on the long drive home, all I could think about was how to train to be faster and more prepared for next year. The race venue- a mini mountain bikers summer camp – was beautiful and convenient, the town and people were welcoming and friendly, the racecourse was one huge challenging loop full of awesome singletrack and beautiful back roads, the aid stations were fully stocked with well prepared and helpful volunteers and the after party was just what every race should be – a fun atmosphere with good food, great beer, laughter, and friendly company. 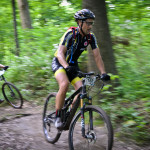 The Mohican 100 is part of the National Ultra Endurance Race Series. The NUE Series is dedicated to providing a level playing field for ALL, Professionals and Amateurs alike and consists of fourteen races across the US and one in Costa Rica. The winner in the men’s and women’s Open, men’s Single Speed and men’s Masters 50+ receive a final cash payout, free entry into the following year’s NUE races and an all-expense paid trip to race the LaRuta de los Conquistadores stage race in November. This entry was posted in News and tagged christian tanguy, marlee dixon, National Ulta Endurance Series, NUE by Shannon Boffeli. Bookmark the permalink.